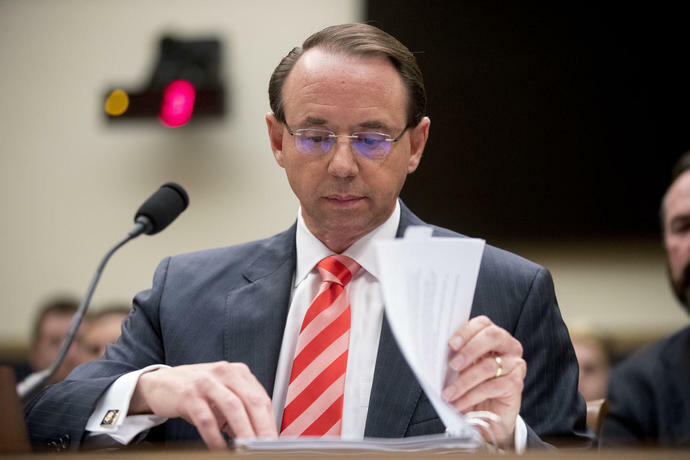 WASHINGTON (AP) -- A group of 11 House conservatives on Wednesday introduced articles of impeachment against Deputy Attorney General Rod Rosenstein, the Justice Department official who oversees special counsel Robert Mueller's Russia investigation. The move comes after months of criticism aimed at the department - and the Russia investigation in particular - from Trump and his Republican allies in Congress. Trump has fumed about Mueller's probe and repeatedly called it a "witch hunt," a refrain echoed by some of the lawmakers. The impeachment effort is led by North Carolina Rep. Mark Meadows, who talks to Trump frequently and often defends him to his colleagues. It's uncertain how many of Meadows' fellow Republicans agree. Rosenstein, along with FBI Director Christopher Wray, faced dozens of angry Republicans at a House hearing last month. The lawmakers alleged bias at the FBI and suggested the department has conspired against Trump - but many could draw the line at impeachment. Meadows heads the conservative Freedom Caucus and has sparred with Ryan on issues from immigration to federal spending. His open threat of triggering a vote on impeachment - which he can do if he follows a certain set of procedural rules - could help him win concessions on other contentious issues before the House.